What gorgeous presentation M! I love sticky rice! 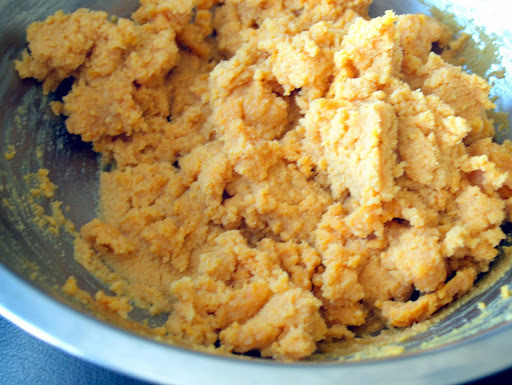 The pumpkin coconut compote sounds super scrumptious! Compote sounds to fancy! I think hanging around you and Anuradha, I might just start to develop a sweet tooth! Happy to be cooking with you, G! What a great recipe! Love it. Thanks a lot for sharing. This is the most sosyal puto maya I've ever seen lol. Glad your Mama is coming over for the holidays. Fun indeed. I never knew it was called Puto Maya but I adore sticky rice with coconut and love love this unique version! Your photos are beautiful too! An: thanks for the sweet words An. Glad to be cooking with you . Annapet: with all the Macarons you're doing...well yes in due time. Weber: thanks fo dropping by and for the kind words. TagaTugue: haha it doesn't look like the ones we are used to ba? Haha. Deanna: hello and great to meet you. Thanks for the kind words. 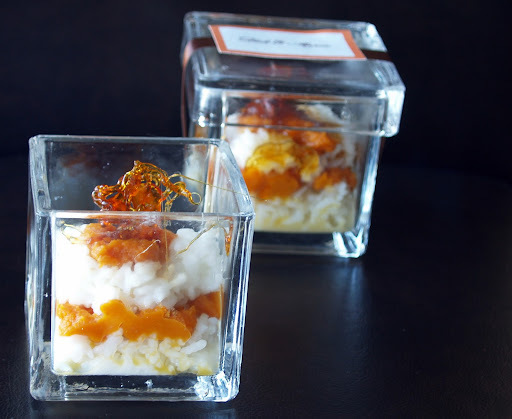 What a great spin on sticky rice. So good to be connected with you now! i love sticky rice! this looks delicious with the pumpkin compote. i think i can veganize this and make this gluten free too :D. sending some #applelove to you! The photos are stunning and all looks enticing. Kudos to you for doing this amid the busy time - but they're fun times! Hi Regan: Great to meet you too. This is a fun bloghop since i get to meet new friends and learn about food and culture. Junia: thanks Junia, you are an awesome host. You know how to stir up excitement and fun. yes squashlove you mean haha.. but I take applelove just the same hihi. Claudia: Yes my hubs calls it superpowers haha. But when there's fun involved who wouldn't want to dive in right? Happy weekend! very beautifully presented.. i love sticky rise desserts and this is just perfect for fall.. have an amazing weekend! and hope to see lots more squash cooking from u! Whoa! I need to make this and when I do be sure to tweet me "gaya, gaya puto-maya", LOL! Seriously, this is delish. And your pumpkin yemas look similar, but better though, than my Yemas de Kalabasa. What a wonderful reunion you're having. Be sure to post pics on all the food, memories & family fun. Enjoy, Malou! And welcome to your new home in STL! Cheers! Richa: thanks for the kind words. So gkad to meet you too. Betty ann: thank you for your well wishes. Ill definitely take pictures. I'm just too excited. 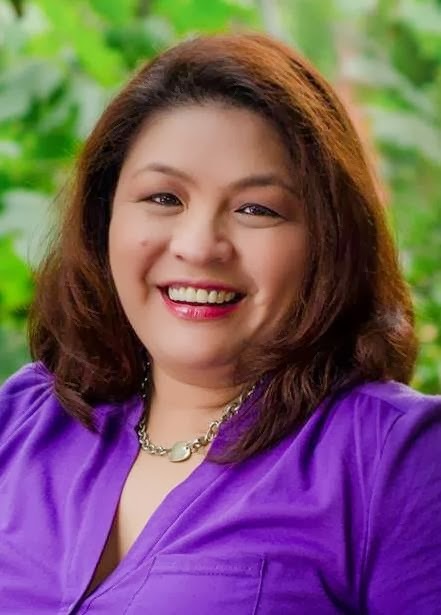 Gorgeous photos Malou! I'm so happy for you and your family to be together. Thanks for visiting us at Teaspoon of Spice often. We love cooking with you. I make sticky rice often in the winter to warm up my kiddies! This looks like quite a comforting dessert. I love the beautiful amber autumn colors. family coming over is i bet both exciting and fun! happy that your family will be spending holidays with you! 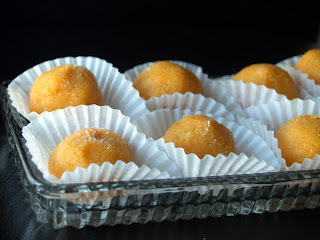 thanks for sharing this recipe, i know the word puto maya but i didn't actually know what it is, until now...LOL! this is indeed a lovelye dessert! That's a nice sweet! And I love the presentation, I really like your glasses! 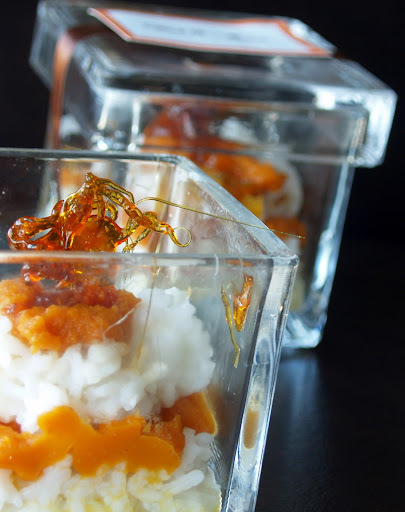 I love sticky rice and it sounds great with the pumpkin coconut compote! Lovely photos! Gorgeous presentation - really great photos! I adore sticky rice and I've never made it at home. This looks like a fantastic recipe! Congratulations to your sister and brother-in-law and I hope you enjoy a very happy visit with your family. I love holidays that center around food. Especially holidays that center around pumpkin! This sticky rice looks heavenly. Leilanie: I haven't tried it yet but they say the quickest way to slice a pumpkin is roasting it first. Others even used microwave!!! with that said, maybe you could use your pumpkin soon haha. Serena: Oh don't mention it, Im just glad I discovered your site. HOping to start a good "blog love" relationship hihi. Christine: Hello and love to see you around. Hugs to ALex! Valerie: Hello yay you made it to squashlove, lemme swing by your place to say hello to! Mike: Hello again. Thanks for the compliments... will stop by today to your site too. have a great weekend. Joanne: Yeah we may sound like a scene from Big Fat Greek Wedding don't you think haha.. but yeah it would be a great time... fun times fun times! I think I've found a new love... delicious recipe, gorgeous photo's - just all around brilliant. So nice to meet you and look forward to trying this soon. I love sticky rice, this sounds such an awesome recipe. A new dessert to me! but it looks so delicious!!! I love sticky rice and mango...or used to until I found out I was allergic to mango :( So this recipe is a perfect alternative!!! I love your presentation too! What a wonderful presentation and such a fun recipe...fantastic! This is my favourite part: sticky rice!!! I am addicted to sticky rice: savory or sweet. I just had sticky rice with coconut milk and mango at Suvarnabhumi Airport and it tasted great! But with Pumpkin Coconut Compote, sounds even yummy! Lots of squash love for ya! Georgie: Thanks for the kind words and the feelingis mutual, so great to know you too. Reem: Thank you for admiring the way I presented my dish, when you have your Mama as an inspiration, it makes a difference! Anh: Hello and thank you for stopping by. Amy: I'm glad i offered you an alternative and i feel sorry for you for being allergic to a luscious fruit. Alisha: Hello, lovely to see you again. Yes i'm slowly getting there, though there are a lot of things to be done yet. Rika: yeah mango is the usual partner but when paired with pumpkin compote or pumpkin yema it gave the same delightful taste. thank you! Love both your recipes and gorgeous photos too! My family loves sticky rice (and mango), but I've never made it before. Do you use a special rice to make it? Happy #squashlove!!! I'm all over that stick rice...looks so yummy! Looks like dessert from fancy restaurant Malou! 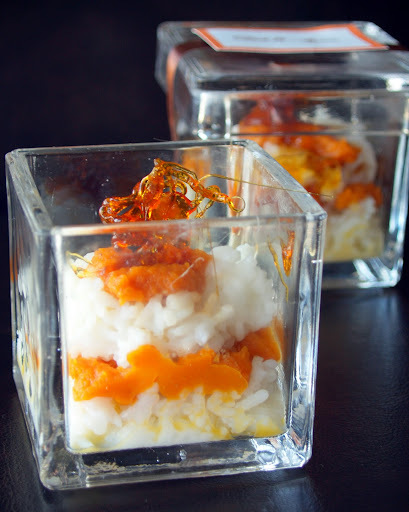 I love the presentation and sticky rice is delicious and coconut is my favorite... YUM!